What’s the opposite of reducing? 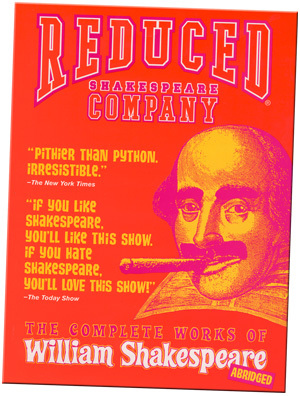 Some years ago, we brought home the Reduced Shakespeare Company DVD, The Complete Works of Shakespeare (abridged), from the local public library, because Hyla couldn’t get enough of Shakespeare and the back cover made it sound like fun. And it was. Maybe portions of it were slightly inappropriate for a six-year-old, but most of it made us all laugh out loud. We’ve been quoting from it ever since (“Maybe! Maybe Not!”). When we learned that the local high school was putting on a production of it this November, we put the date on our calendar. And tonight was the night. A company of 8-10 high school actors put on a terrific show. We sat in the front row and Hyla’s smile was as wide as anything, seeing her favorite scenes performed live, and getting to quote some of her favorite audience-participation lines before the actors told us what to say (“Maybe! Maybe Not!”). As we were driving back home, Hyla was saying how much she wanted to rewatch the DVD and it occurred to us that we’d never actually bought the DVD – we’d only ever borrowed it. Hmmm. Well, we could always go to the library tomorrow morning and borrow it again, right? Alternatively, we could go home, check online to see if the local Borders had it in stock, call the store to verify that they did have it, load everyone (including the dog) into the car at 9.30 pm and drive to Borders, and buy it. I’ll give you one guess which option we chose.